The weather is warming up and most folks would probably rather spend time doing fun things with the family than cooking. So during the month of May, Keystone Meats will celebrate National Beef Month with the "Beef Up Family Time" recipe contest. Throughout the month, Keystone fans are invited to enter by submitting their favorite beef recipe on Facebook or online. 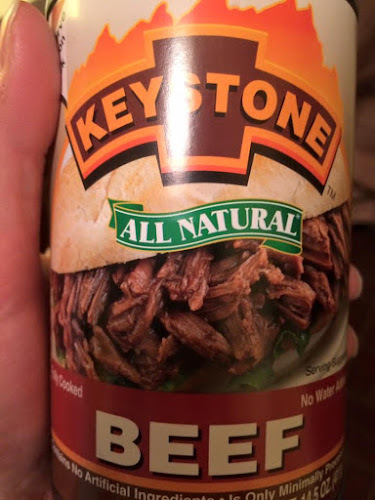 All dishes must use Keystone Beef and take 30 minutes or less to make. We've tried Keystone Beef before and were impressed with the quality and flavor. I never thought I would embrace canned meat, but hey, I like tuna salad and that's technically made with canned meat. We plan to enter and already have a couple of recipes in mind. There are three contest categories (5 ingredients or less, family tradition, lighter meals) but only one winner. The prize? A year's worth of Keystone Meats. Enter at https://keystonemeats.com/beef-up-family-time-recipe-contest/ or on Facebook at https://www.facebook.com/keystonemeats/app/247578258730350/. The deadline is May 31st, 2017.